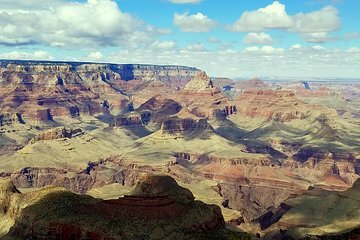 Verschaffen Sie sich einen umfassenden Überblick über den Grand Canyon und die umliegenden Attraktionen während dieser 12-stündigen Tour von Sedona aus. Erleben Sie die Painted Desert, sehen Sie die Ruinen der Ureinwohner Amerikas und vulkanische Lavafelder. Fahren Sie bequem auf einigen der malerischsten Straßen des Landes, während Sie den Kommentaren Ihres Reiseleiters lauschen. Eintrittsgelder, Mittagessen und Hin- und Rückfahrt ab Sedona sind im Preis inbegriffen. Reisen Sie an einem Tag von Sedona oder Flagstaff zum South Rim und zum weniger besuchten East Rim des Grand Canyon. Seien Sie in Ihrem Sedona Hotel zwischen 7:00 und 7:30 Uhr bereit. Abholung ist auch in Flagstaff zwischen 8 und 8:30 Uhr möglich. Steigen Sie mit Ihrem Reiseleiter und Ihrer Gruppe in ein komfortables Reisefahrzeug und machen Sie sich dann auf den Weg durch den Oak Creek Canyon, der als einer der schönsten Nebenstraßen der Vereinigten Staaten bekannt ist. Fahren Sie durch Flagstaff und erkunden Sie die Lavaströme am Fuße des jüngsten Vulkans Arizonas, dem Sunset Crater. Fahren Sie fort, einige indianische Ruinen am Wupatki National Monument zu besichtigen, wo Sie einen Blick in das tägliche Leben der ersten Bewohner der Gegend werfen können. Fahren Sie hinunter zum Cameron Trading Post im Navajo Indianerreservat, vorbei an den bunten Klippen der Painted Desert. Essen Sie im Speisesaal mit Blick auf die Schlucht des Little Colorado River und kaufen Sie dann ein paar Souvenirs ein, bevor Sie zur Hauptattraktion aufbrechen: dem Grand Canyon selbst. Besuchen Sie sowohl den Ost- als auch den Südrand für Fotoaufnahmen und erfahren Sie mehr über die Geschichte der Geologie, Flora und Fauna des Gebiets. Halten Sie im Grand Canyon Village, Kolb Studio und der Grand Canyon Railroad Station. Rückkehr in Ihr Hotel in Flagstaff oder Sedona am Ende des Tages. Mark, our tour guide is a fantastic guide. You can tell he really likes his job! He was interesting and funny. He grew up in the area and knows the Grand Canyon extremely well. Our guide, Sheldon, was excellent, We encourage those looking for a trip to the Grand Canyon to consider this tour. The stop at the ruins was informative followed by the Cameron Trading post and Sheldon's recommendation for a Navajo lunch vs American lunch. I was impressed with the knowledge of the guide.it was really nice. He gave us plenty of water to drink. He picked us up at the hotel. We got to see different views of the canyon also the red rock formations. The lunch was good and plentiful. Charlie, our tour guide, was awesome. He was very knowledgeable, friendly, and considerate. It was a wonderful tour of the Grand Canyon as well as several other stops. I highly recommend this tour to anyone who wants to see the best views and learn so much about the entire area. Really interesting guide who was very knowledgable about the tour stops. We enjoyed learning about the landscape and native peoples. The views of the Grand Canyon were amazing!! We only wished that we could spend more time at each stop to take pictures and admire the views. The small van was comfortable and gave it a more personal touch. Lunch as very good!! Our guide Kevin made our tour so very worth it. He is very knowledgeable and our group saw things they had never seen before and learned so much. Kevin was always so helpful and I was so amazed how he remembered all our names and made all feel so included and I personally felt it was the best tour I'd been on. Kevin has a wonderful sense of humor and it kept us alert and so interested all the time. I definitely would recommend this tour company. We were very fortunate to be guided by Brian a highly knowledgable scholar of the indian cultures that existed and continue to exist in the 21st century southwest. While he sounded professorial, he added a lot of wonderful humor and entertainment and mixed the cultural golden nuggets with humor. He is worth more than Coronado's Seven Cities of Gold. One more thing, thank you for sharing your 50's Golden Oldie's your grandmother and you listened to probably in the seventies.We loved them. Kevin, our tour guide made the trip a great experience. Within a few minutes he knew us all by name and what each of our interests for the trip were. He made sure each person got what they came for whether it was the sites we visited, information about our specific interest, the culture, the influence and rich history of the American Indians, or the animals, plant life, etc...He knew it all. We viewed three sides of the Grand Canyon. Kevin knew how to avoid the crowds the entire day. Also visited a volcanic lava site, an ancient Indian Ruins site, ate lunch at an authentic Indian Restaurant, witnessed a beautiful sun set, and saw many animals including antelope, deer, and more. A great trip. This is a great tour. Small 16 passenger bus, very knowledgeable drivers/tour guides, and they take you to several places along the rim of the Grand Canyon, some of which most tourists don't know, so you have it pretty much to yourself for viewing and photo ops. And it is an all day tour, not some quicky two hour thing. The guide was late picking us up at the hotel so we had to cut out one part of the tour, but we made it up at the Canyon itself. Guide was very knowledgeable and personable. We made 5 stops along the south rim and stayed the appropriate amount of time. overall, a great experience!